Nathan Outlaw's eponymous fine dining restaurant in Rock, Cornwall, has become a true destination restaurant, attracting foodies from far and near. I last visited the restaurant in June 2011 and a lot has happened since. Ever since seafood chef Nathan Outlaw was awarded a second Michelin star in January 2011 he has been on a roller coaster. First there was a book deal: his first book Nathan Outlaw's Seafood was published in 2012 and there's a second book in the making. Nathan has also opened two new restaurants. In 2012 he opened his London restaurant Outlaw's at the Capital and in 2013 Nathan Outlaw's Fish Kitchen, located some 15 minutes from Rock in Port Isaac, saw the light of day. Nathan Outlaw (35) started working as a chef at only 14 years old and he held positions at a number of restaurants before opening his own in 2003. He discovered his passion for seafood while working at Rick Stein's Seafood Restaurant in Padstow (where he also discovered a girl called Rachel, his future wife) and worked as head chef with John Campbell at the then two-star The Vineyard at Stockcross when he decided to set up his own business. 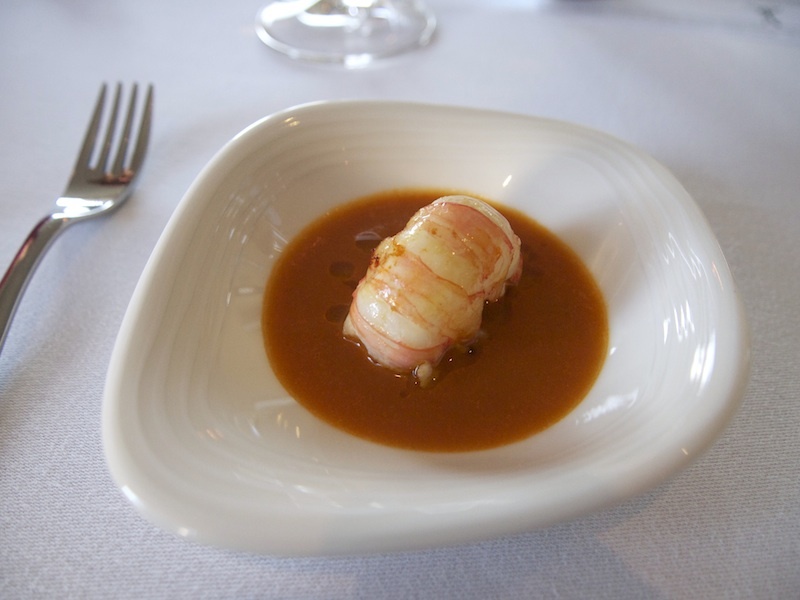 Since 2010, his fine dining restaurant has been housed in the St. Enodoc Hotel in Rock, a seaside hotel with 16 rooms and 4 suites with views across the Camel estuary to Padstow. Restaurant Nathan Outlaw is open for dinner Tuesday till Saturday. The restaurant offers a set 6-course tasting menu for £99. 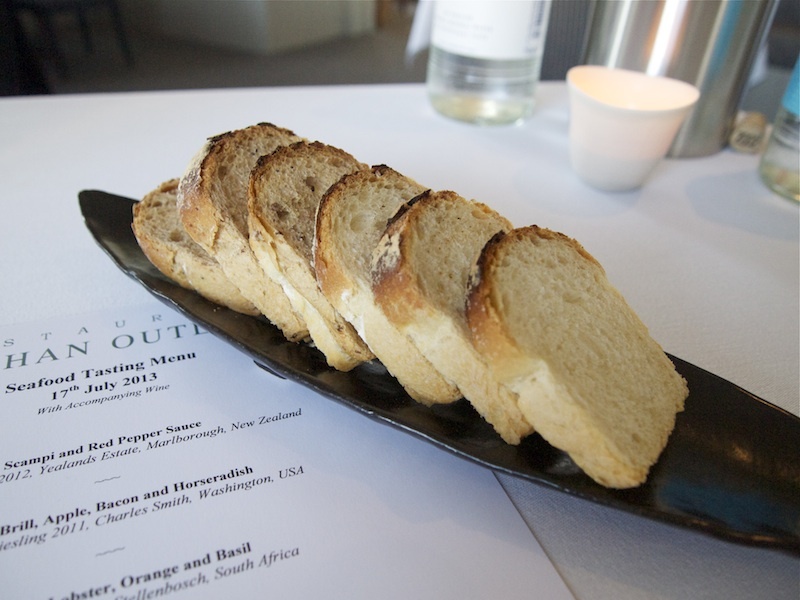 Below is a (somewhat belated) review of the meal I had at Restaurant Nathan Outlaw in July 2013. Our meal started with two amuse bouches. First a juicy scampi served with a very pure red pepper sauce, that had a hint of saffron, and a delicious tomato, red pepper, chilli and red onion marmalade at the bottom of the bowl. 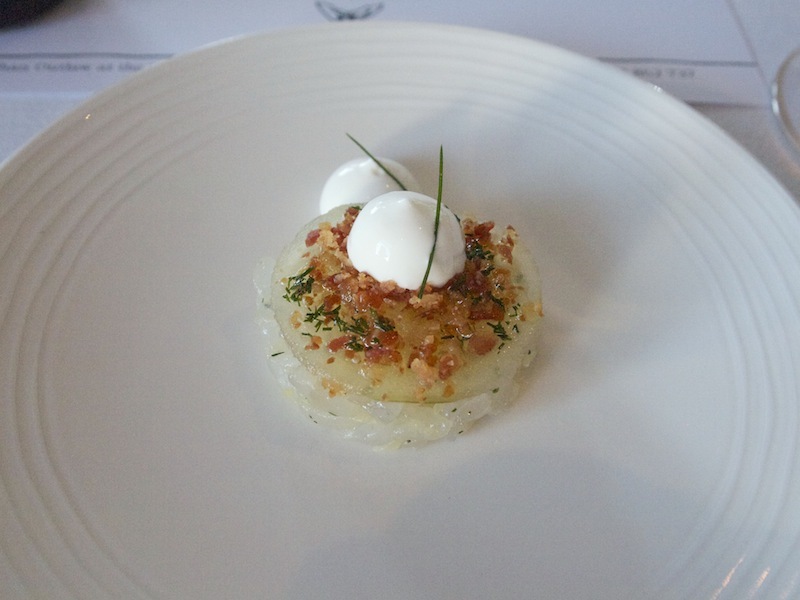 This was followed by cured brill tartare, flavoured with finely chopped dill, covered with a thin slice of apple, topped with bacon crumble and a light horseradish cream. Lovely fresh flavours from the brill that combined nicely with the salty bacon. Freshly baked white and multigrain bread. First course of the tasting menu was Port Isaac lobster, orange, basil, samphire. 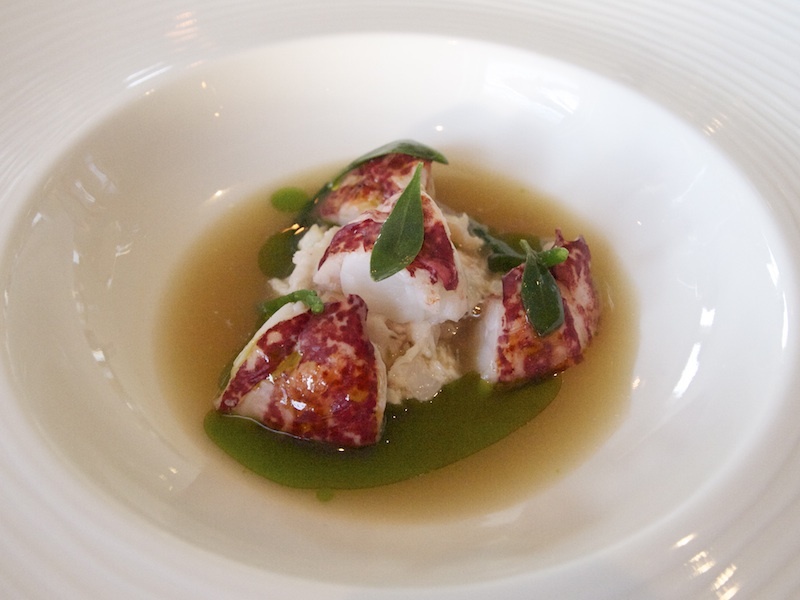 Succulent large lobster pieces formed into a lobster, with some finely chopped lobster meat underneath and served with a sublime lobster stock, infused with basil oil. Wonderful combination of flavours, sweetness from the lobster, a touch of warmth from the basil and some salty freshness from the samphire. The basil flavours were well-judged. Too much basil would have thrown the dish off balance. 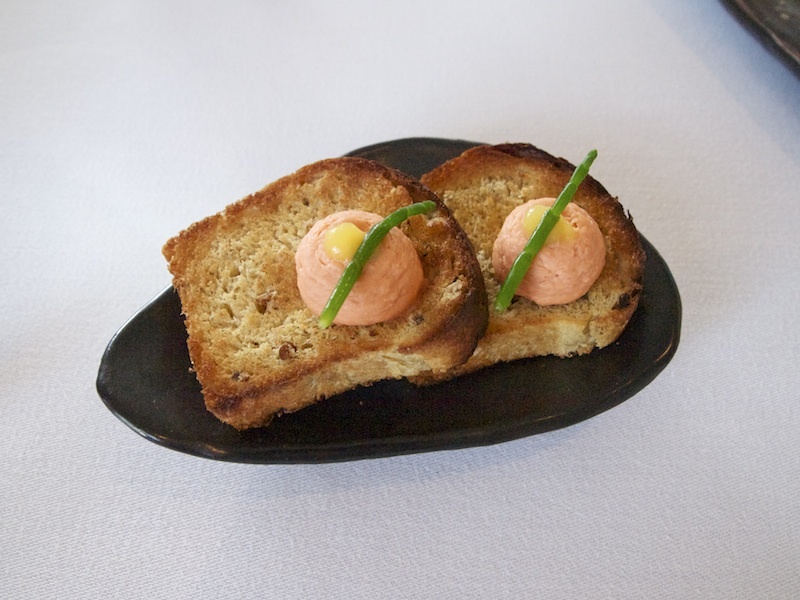 Crisp, toasted bread with lobster paté, some orange puree and samphire was served on the side. What sets this dish apart is Nathan Outlaw’s exceptional talent for capturing the essence of an ingredient and treating it with respect. Top-quality lobster like this doesn’t need a twist, it’s wonderful as it is. 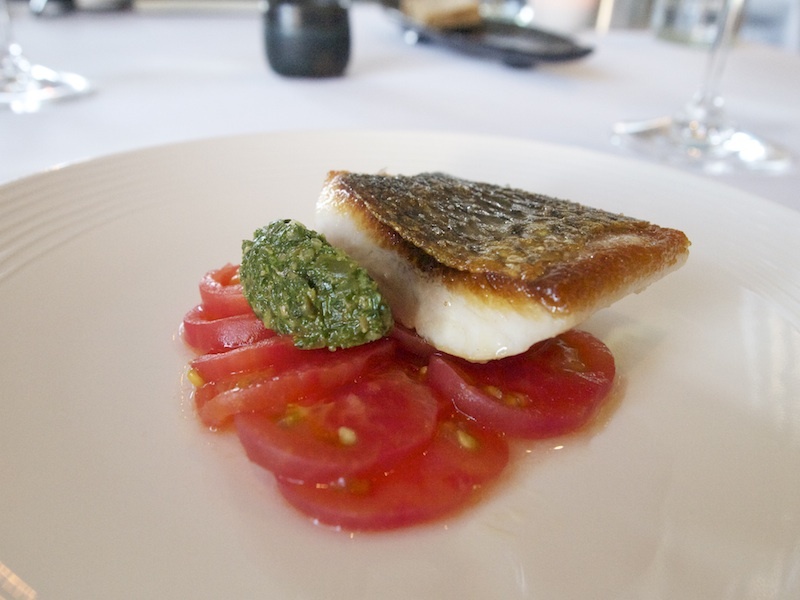 Grey mullet, tomatoes, olive oil and green sauce followed. An brilliant piece of grey mullet with beautifully moist flesh and a sublime, crisp skin. The mullet was accompanied by some thinly sliced, smoked tomatoes and a pungent green sauce. Smoking the tomatoes made them extra juicy and flavoursome and the smokiness added a touch of warmth to the dish. The green sauce, which was made with mint, capers, parsley, gherkins and anchovies, had just the right amount of sharpness and the mint really lifted all the other flavours. A terrific dish with wonderful rich flavours and elegant sweetness. Loved the simple, clean presentation. Third course was Turbot on the bone, tenderstem broccoli, saffron and garlic. 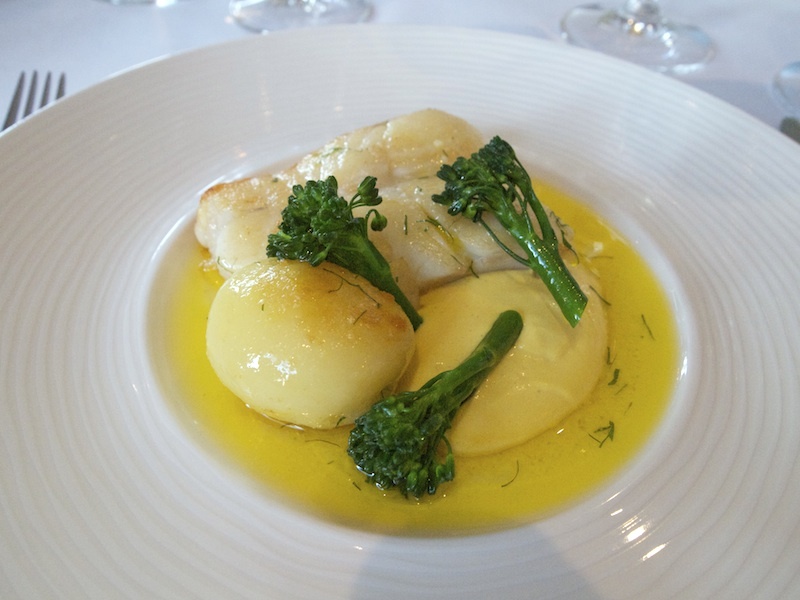 Beautifully cooked turbot, on the bone as it should be, served with saffron aioli and a vinaigrette. The aioli had a creamy texture and lovely sweet garlic flavours. Also on the plate was a delicious Casablanca potato and lovely tender broccoli. A wonderful dish with precise, warm and rich flavours, the richness balanced perfectly by the vinaigrette. Next was a superb cheese course. A goat's cheese nugget, placed on top of some airy goat's cheese cream, served with a slice of beetroot, topped with beetroot puree, diced beetroot and garnished with candied walnuts (no photograph). 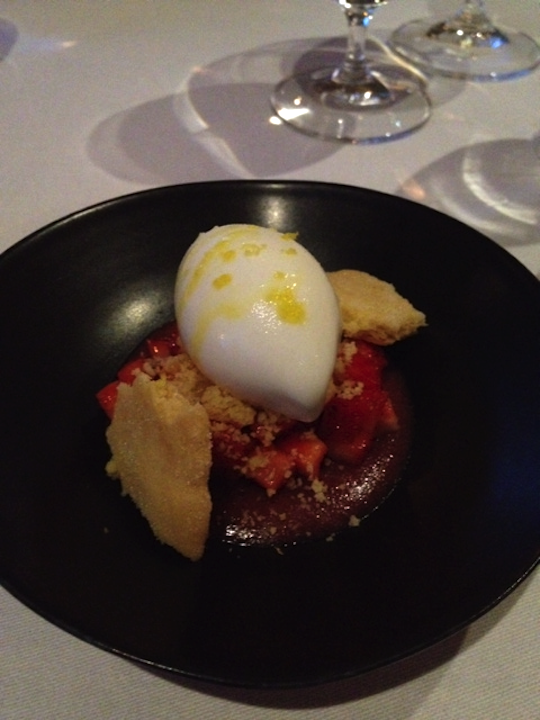 Fifth course, and first of the two desserts, was Strawberries, yoghurt, shortbread. An intense clean-tasting stawberry puree, chopped marinated strawberies, two pieces of shortbread and a yoghurt ice cream. A lovely dessert, although the ice cream was on the creamy side, perhaps lacking some sharpness. Last and sixth course was Gooseberry tart, peach, hazelnut. 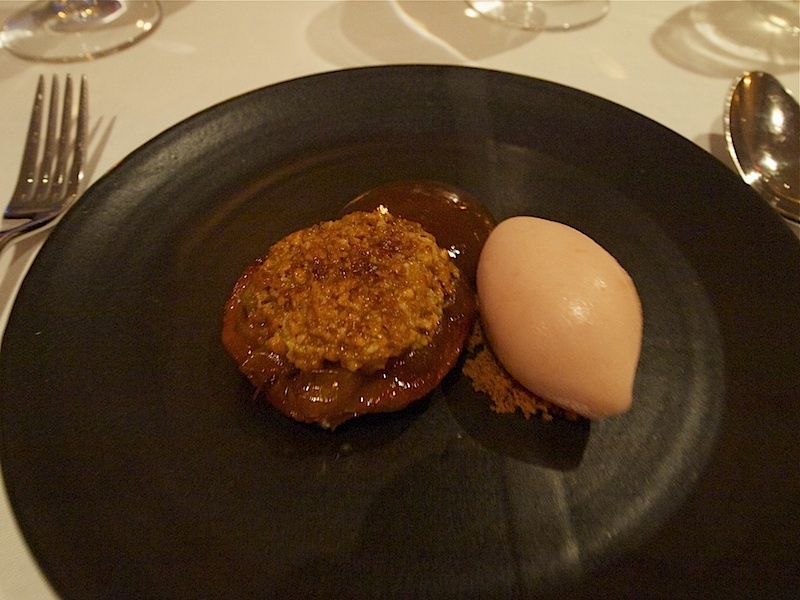 A fantastic sweet and sticky tart with a deliciously crisp puff pastry base and a gooseberry and pineapple filling, served with a concentrated peach puree and peach sorbet. Nathan Outlaw aims for continual progression. When a chef is already cooking at a two Michelin star level, progression will by definition be gradual and consist of many small steps. I have obviously not been privy to everything that has been done since 2011, to elevate the level of cooking at this restaurant even further. Judging from this meal however, the results are impressive; the improvement is subtle but clearly discernible. The seafood dishes at Restaurant Nathan Outlaw have been refined even further and Outlaw manages to make the produce transcend itself without transforming it. The precision and skill, with which he finds the essence of the flavour of his aquatic ingredients, is unsurpassed. The desserts, very good though they are, are outshone somewhat by the brilliance of the fish dishes. Even if Restaurant Nathan Outlaw bears the name of the executive chef on the door, it is also very much a team effort. I would like to mention especially the names of Chris Simpson (head chef) and husband and wife team Stephi (restaurant manager) and Damon Little (sommelier). This establishment occupies a quite unique place on the UK dining scene, both geographically and gastronomically and it displays a healthy ambition to achieve even greater heights. I can't wait to go back.